This article was originally published in October of 2011. 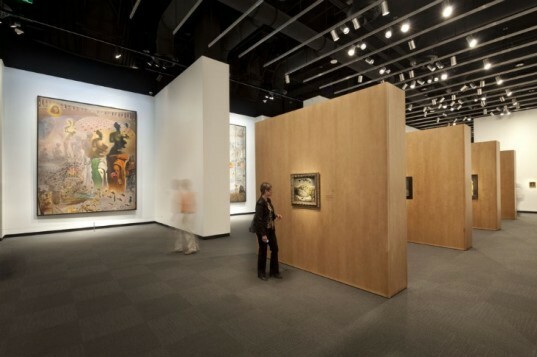 Earlier this year we reported on the opening of the stunning Salvador Dalí Museum located in St. Petersburg, Florida. The museum is home to the world’s largest collection of Dalí works, and since its debut this past April, the dazzling venue has already welcomed over 300,000 visitors. With its clean minimalist lines juxtaposed against a sparkling geodesic glass atrium, the spectacular structure designed by HOK stands as a work of art in its own right, while still paying homage to the spirit of Salvador Dalí. The building also brings more to the table than just its looks. Housing over 2,000 pieces of Dalí’s most important works, the museum is sited within a corner of the country that often finds itself battered by severe storms with catastrophic results. To prepare for the worst, HOK designed the shell of the structure to withstand a Category 5 hurricane. The design also features numerous green systems, including a solar hot water powered dehumidification system, high efficiency HVAC and ventilation systems, and strategic daylighting to illuminate the interiors. We recently sat down with principal architect and Senior Vice President of HOK Yann Weymouth who enlightened us on the intricacies of the design, and what it took to get the museum built. Jump ahead for our exclusive interview with Yann as he explains the design, and how his team of architects and engineers used Building Information Modeling to build a space that’s not only beautiful and sustainable, but disaster-proof. INHABITAT: How did you get started with HOK? YANN: I joined HOK ten years ago, because of the firm’s commitment to sustainable design. HOK was about to publish the first edition of the Guide to Sustainable Design, and I had a bootleg copy. Since my days as a student, and reading and meeting Buckminster Fuller, I had been convinced this was a crucial aspect of making buildings. HOK was helping break new ground, and I wanted to be part of that effort. 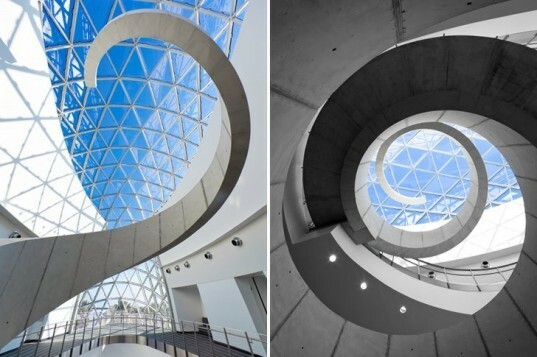 INHABITAT: How did your/HOK’s involvement in the Salvador Dali Museum come about? YANN: We were invited to submit a concept design in a competition. The museum’s brief called for an addition to the existing building. We won because we broke the brief with a design for an entirely new structure. Our research showed convincingly that it would be as expensive to add to the original old and frail structure as it would be to create an entirely new one, with a far better results. 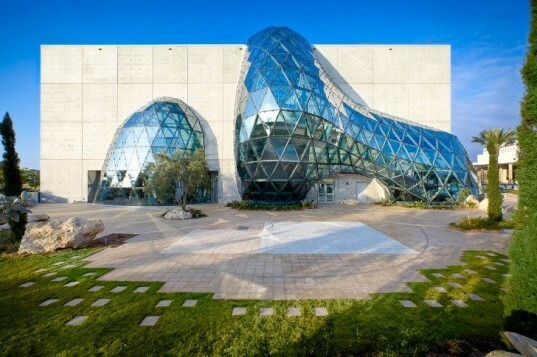 INHABITAT: The museum houses the world’s largest collection of works by Dali, how did this influence your design of the building? YANN: Dali is the best known of the surrealist artists, and as an explorer of the subconscious, but he was also fascinated by the forms and the mathematics of nature. His art plays consistently with the difference between Euclidean reality and surprising organic forms. We wanted to avoid the kitsch of melting clocks and “themed” surrealism, but sought, in a frank and abstract way, to make a reference to that contrast between Cartesian geometry and organic shape. Dali and Buckminster Fuller were longtime friends, both fascinated by the intrinsic geometries of nature; it seemed natural to make a strong contrast between the stark raw concrete box that protects and shelters the collection and the almost liquid, transparent and facetted form of the glass “enigma”. INHABITAT: What was the most challenging aspect in desiging the museum? YANN: The building is now finished and open, and in its first 8 months has attracted 300,000 visitors; by the end of the year the museum will double its yearly attendance. But there were several challenges to resolve during the design process. The first was to ensure the safety of the collection from hurricanes by making the building a Category 5 resistant structure, and placing all mission-critical functions above the potential 28’ storm surge. A second requirement was to stay within the tight budget by prioritizing every decision on materials, systems, and working closely with our engineers, the construction manager, the Beck Group, the client project manager (Peter Arendt) and the director on every decision. The third was to discover how to integrate the geodesic geometry of the glass enigma properly with the concrete structure of the building. We solved these by working very closely and collaboratively between all our teams, but it took energy, patience, and time in the design process, to then have a project that in construction went very fast. 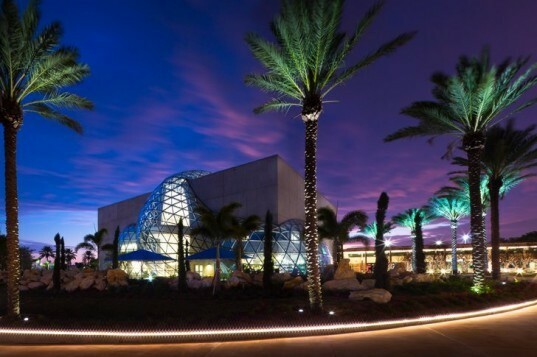 INHABITAT: What is your favorite part of the Dali Museum? YANN: I really love being in the atrium space, which is very three-dimensional and different from every viewpoint and at all times of day and night. The spiral staircase is a totally functional way to move from the ground to the galleries, but it is also a structural tour-de-force and a sculptural gesture to the sky. INHABITAT: Your team used a BIM (Building Information Modeling) process with the Dali Museum. How important was it to your design and construction process? Can you explain how your team used it and how it helped you? YANN: This was our first project using BIM in every aspect of the design. We had just adopted Revit, and it took us a moment to adjust to a new way of working, but it was essential to this design. We used hand sketches, watercolors, and took them into CAD, SketchUp, then into Revit and Rhino to figure things out and communicate them. Since then all our projects have used BIM. 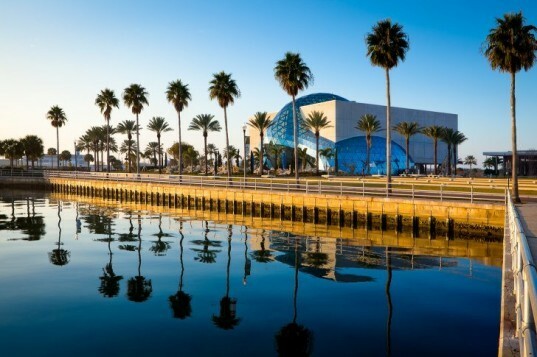 INHABITAT: Given the museum’s location it was important that the structure be built to withstand a Category 5 hurricane. How has BIM technology allowed you plan for this in terms of both architecture and engineering? YANN: Our structural engineers, both Walter P. Moore, and Novum, who did the free-form geodesic glass enigma relied entirely upon BIM, working form our BIM models, to calculate structural forces. Indeed the geometry of the tessellation of the triangulation was determined by parametric algorithms, so the shapes of the triangles, no two of which are identical, is a pure reflection of the forces involved. INHABITAT: The building features numerous green systems, including a solar hot water powered dehumidification system, high efficiency HVAC and ventilation systems, permeable pavers, and strategic lighting – did BIM play a role in optimizing the efficiency of these additions? YANN: BIM was helpful, but old-fashioned common sense and calculations played a big part too very early in strategic decisions, such as building orientation, where to open to vistas, where to shade spaces. We use the LEED checklist on all our projects, and our mechanical engineers at TLC were deeply involved in optimizing every system, using our BIM building model. 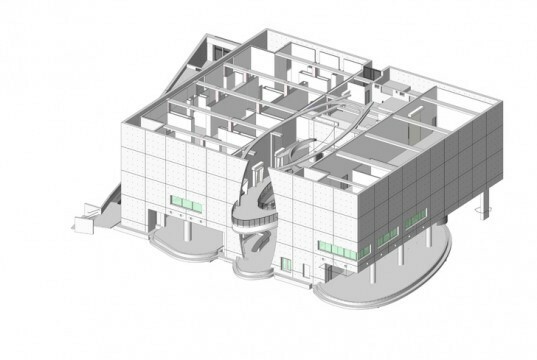 INHABITAT: How did BIM help you troubleshoot as the museum was being constructed? Did fewer issues arise due to the use of BIM from the offset? 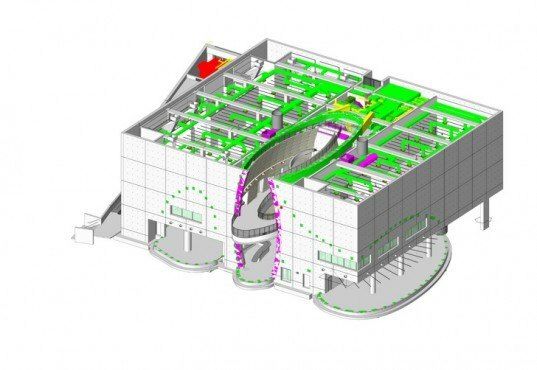 YANN: Beck used our BIM drawings and model very rigorously, and we communicated easily and continuously throughout the construction – as a result there were only a handful of change orders. INHABITAT: What impression do you hope the architecture of the building will make on its visitors? What do you hope they will take away from their experience? YANN: People like the building, and it continues to attract them. A recent museum survey found that some 70% said they came primarily to see the building, before then discovering the collection. We designed the building to create a sense of anticipation of the collection, a celebration of the beautiful bayside site, and to shelter and celebrate an extraordinary and unique art collection. Our hope is that as one walks away from the visit, one carries a deep and lasting memory of a few of the amazing works of art created by Dalí, a desire to return to see more, and a sense of joy and wonder. hi, i am a draftsman(Architecture) and now learning Revit. 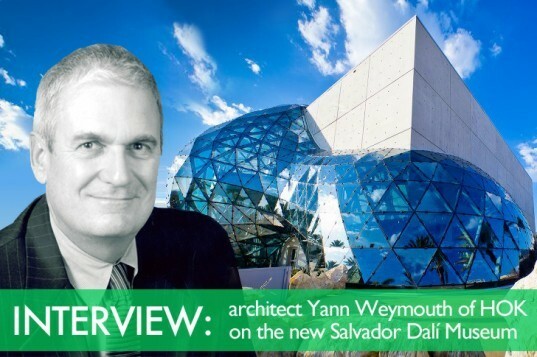 I would say the combination of Yann and Salvador Dali is sublime! This building is amazing! Great interview. I can't wait to visit! the combination of HOK and Salvador Dali is a match made in heaven. Great interview. Can't wait for the opportunity to make it to see the museum in person! I love that HOK paid so much attention to Dali's artwork in the design of the building. I can't imagine a better home for his work! Wow this building is beautiful. I love the concept of using Dali's aesthetic as architectural inspiration! I see so much parametric design in buildings now, its very helpful to read about how these complex buildings actually come together. Great interview Diane. This is one of my favorite buildings ever. Dali would be proud! This is a great interview about a fascinating building. Well done Diane!